Feeder tank has its water level constantly fluctuating, not a good place if you are a fish.. this is where I decide to get the Crayfish, sometimes they were called Crawfish, Crawdad or even fresh water lobster. Not sure its same as Yabbies as in Australia. Just received few to tryout and lets see ... these are easily breed and in feeder tank they should be okay with water not full all the time. Just learned from the person that provide these crayfish. 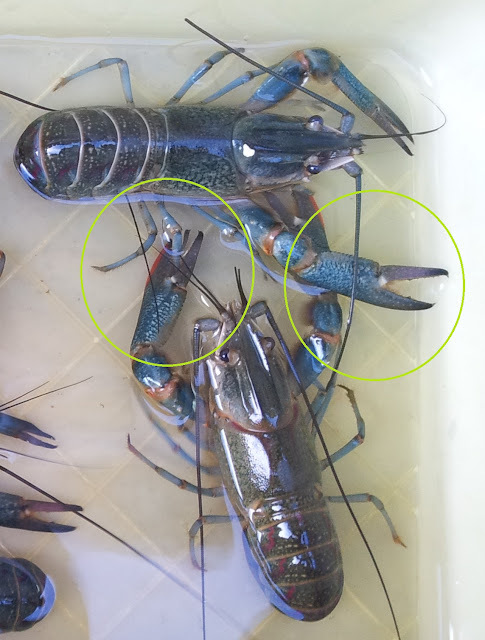 Looking at photo below the top crayfish is female and the bottom is male the different is in the circle. The pincers with reddish colour is male and without is female. Lots to learn on this crayfish, especially how to take care of them. Next would be breeding these crayfish and produce for self use. Few of the crayfish hiding in pvc pipes. 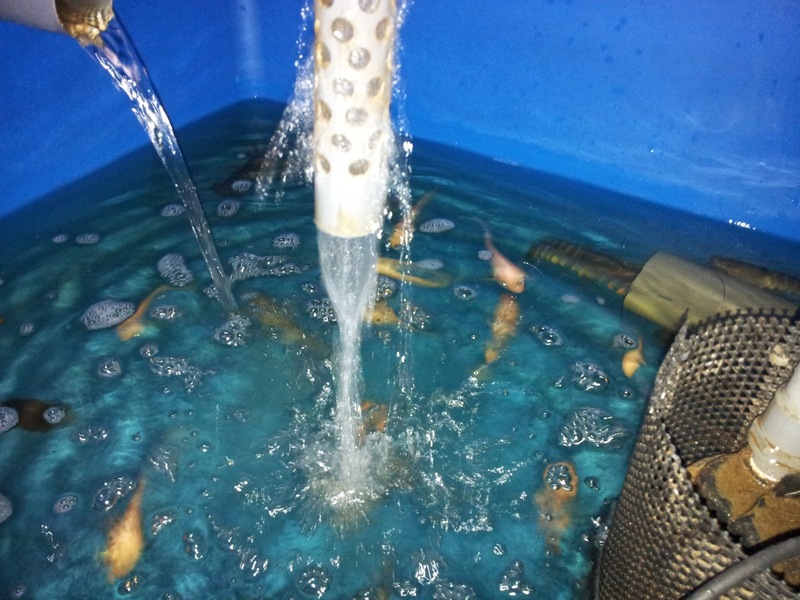 Need to remove most few more Tilapia and leave only a handful to ensure mosquito is under control. Crayfish don't eat mosquito larvae. These Crays are Cherax quadricarinatus - common to North Australia, red claw crayfish. 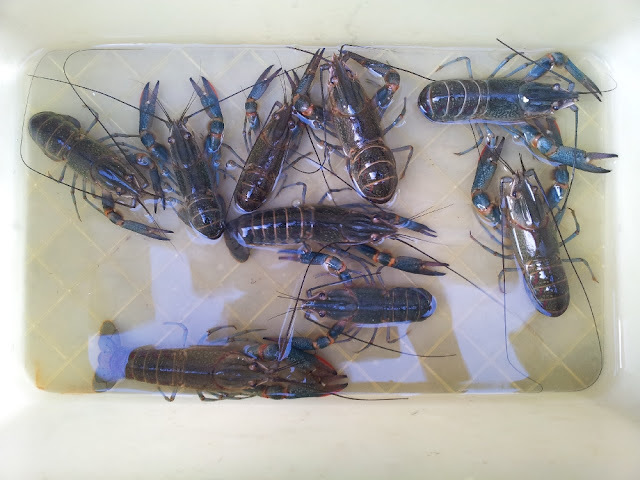 Yabbies - generally people call Cherax destructor a Yabby, but everyone has different names for crayfish in Australia. Both these species have become pests outside of Australia due to flooding of crayfish farms. Thanks for the great info! Do you have an update on raising crayfish? I am very interested in starting an aquaponics crayfish system. Any advice you can provide? Those Crayfish escape because the tank was not covered, I will need to start again. Apart from the running away, it is quite easy to raise. Hi, what do you feed them? We are from Texas and just moved to Costa Rica, we would love to raise our own for personal consumption - do I need cattails if I use an air machine (aquaponics)?? I am curious about this. Would a mesh screen work for the top - to keep them from crawling out? to keep other critters out? I am testing out these, unfortunately most climbed out and escape, I feed them cooked rice, bread and fish feeds. They are scavenger so anything dead at the bottom is food. Earlier, I fed vegetables to my crays. As my stocks grew, I discontinued with the veggies & fed them my own recipe of 'crayfish food'. Pls avoid cooked rice & bread, as it is NOT SAFE. Rice & bread nowadays contain chemicals, which is safe for human not the crays. I'll do my best in answering the questions u have. Btw, the crays wont go out if they feel that they are safe in their habitat. River sand & pvc pipes work nicely to make them feel at home. I have been growing the crays at home since Oct 2012. Thanks for the offer Effendy, I am not ready yet for lobster. I need to get a better enclosure for those Cray, once ready I will try again. P/s : Your comments was accidentally deletes or spam while deleting some Along post. Appologise for that. 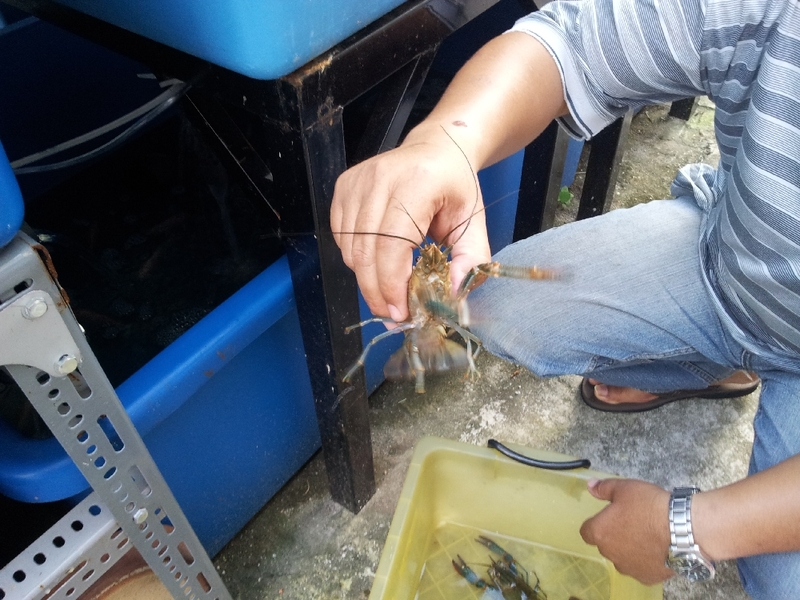 Hey, I am interested in getting live crayfish for my own leisure time. Any chance you can tell me where to get? Hope that we can exchange knowledge in future in taking care of this magnificent creature. I had stop doing Crayfish since they escape easily from my Aquaponics set up. Most aquarium shops do these one place that come to mind is Lot 51 Selangor Greenlane. 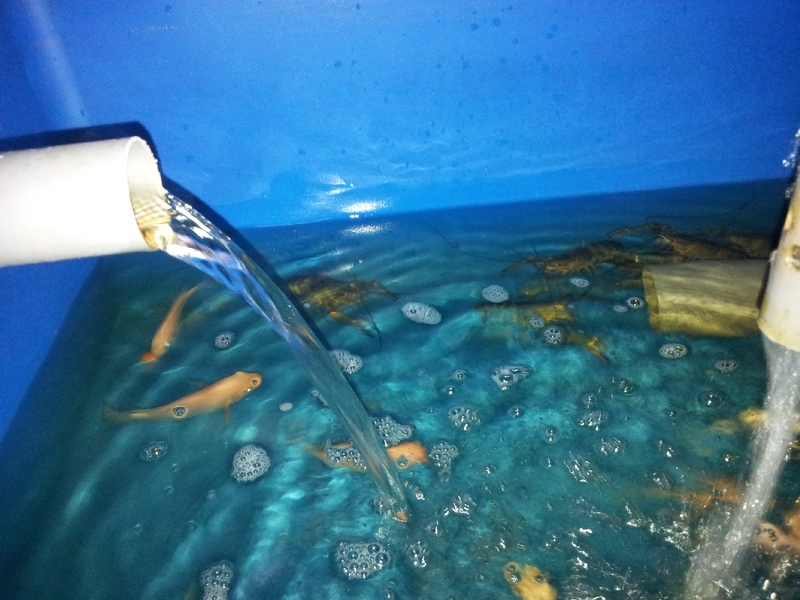 We are interested to import fresh water cray fish. Pls contact us for 100kg trial shipment to Bangkok shipment.